A good bra can be hard to find and when you’re looking for one to support your girls through running and other high-impact activities making a proper selection is even more important. While no one bra will work for every woman there are some features keep in mind that will help to make a bra more comfortable for you. Things like adjustable straps, padded cups, and a nice secure fit can help keep your upper half happy so you can focus on what your feet are doing! Here is a breakdown of some of the best sports bras for women and some information on just what makes them so great. Saucony Athlete Avenger – The Athlete Avenger was made for women with A, B, and C cups that are looking for a comfortable and supportive fit for high-impact activities. With it’s ultra-breathable fabric and keyhole style back it will keep you nice and cool over the course of a long run. Since this sports bra was designed to be light and airy it may not be the best choice for women who prefer the additional coverage and modesty that comes from padded cups. If, however, you are looking for a great and supportive sports bra to keep you cool on the hottest days, you should definitely give the Athlete Avenger a try. New Balance Shockingly Unshocking – The appropriately named Shockingly Unshocking sports bra by New Balance is designed to take the sting out of high impact activities for women with C, D, or DD cup sizes. The Shockingly Unshocking features adjustable shoulder straps, a hook-and-eye back closure, and gel infused backing for a perfect fit and tons of support. This bra’s lined and encapsulated cups provide separation and modesty for larger chested runners who want the focus to be on what their body can do, not how it looks! 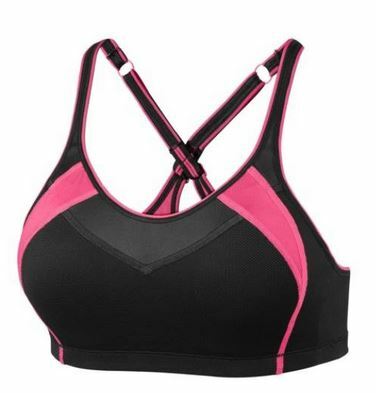 Moving Comfort X-Over C/D Sports Bra – The Moving Comfort X-Over C/D Sports Bra is a cute and comfortable option for women with C and D cups that want a lot of support for high-impact activities. Its adjustable criss-crossed straps provide a lot of support without being thick and bulky. This bra is made of quick-drying stretchy fabric to keep you cool and comfortable during long, hot miles. This bra is made with an eye towards both comfort and sustainability! The interior bra cups feature recycled coffee grounds to wick away moisture and reduce odors. This is a bra that is sure to keep your girls comfortable while putting a little extra pep in your step! Patagonia Capilene Mesh A/B Sports Bra – When it comes to selecting a sports bra, smaller chested women are lucky in that they have a lot of options for going fast and light. The Capilene Mesh A/B Sports Bra by Patagonia is designed to keep smaller chested women cool during high impact activities. Its comfortable, stretchy, highly breathable fabric and seamless design eliminates chafing and allows for natural and unrestricted movement. But just because this bra is light and breathable doesn’t mean it lacks in coverage! This bra is constructed of super-wicking double layer mesh to keep things modest. Oiselle Strappy Bra – Don’t be fooled by the thin looking straps on the Oiselle Strappy Bra! This cute bra was designed to really keep things in place! The Strappy Bra got it’s name for the straps that go over your shoulders and criss-cross in the back giving the bra a really nice look but also a lot of support! All those straps do a really great job of keeping the ladies where you want them! This bra is ideal for women with A/B cups but it has also received rave reviews from women with C cups. This mid-weight bra is made of wicking performance stretch fabric to keep you cool on hot days and warm on cool ones. 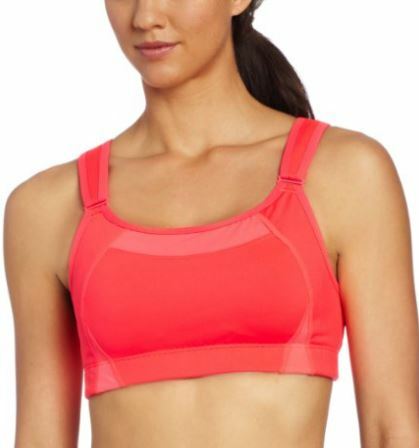 In 2013, Oiselle improved this already great bra with a wider chest strap for even more support. Lululemon Ta Ta Tamer II (C-E Cup) – Sports bra choices are extra important for the more well-endowed among us. With that mind, Lululemon designed the Ta Ta Tamer II for women with C-E cups who are looking for a whole lot of support in a cute and comfortable package. The Ta Ta Tamer II is fully adjustable with straps that can be lengthened and shortened and hook-and-loop closures in the back to allow you to truly customize your fit. This bra comes with removable cups to allow for even more customization. Use the cups when you want more shape and coverage or remove them to allow for extra ventilation! The Ta Ta Tamer II is a bra that was designed to provide lots of options, coverage, and support for women that really need it! Hopefully this list will have you and your girls running comfortably for many miles to come! This entry was posted in Sports Bras and tagged Sports Bras.